Who: Lisa “Tiny” Gray-Garcia is the founder of Poor Magazine (poormagazine.org). She is an independent reporter, writer, educator, and activist. Over the summer she and PNN Radio co-host Leroy F. Moore reported on the Poor People’s March on Washington by embedding with the march for over a week. Her latest book, Poverty Scholarship, is scheduled for release in February 2019. What: Spoken-word poetry teaches people about the homelessness experience which the corporate world fails to recognize. Poor people are emerging from communities once intact, but now turned into “broken-windows” neighborhoods. Often their apartment buildings are slated for redevelopment by landlords. Once these people are evicted they are considered homeless which exposes them to routine humiliation or exploitation by the nonprofit sector. Why: Homeless people should not be treated like institutional trash to be used of and disposed. Poor people are often intelligent but displaced human beings who can share their funds of knowledge. Instead they are wrongly targeted by authorities and police who hunt them down. The issues they face happens to every one, but if you are a minority, disabled, and poor, you are more easily taken advantaged of. How: When you are poor, disabled, and homeless person of color it is much easier to end up with tickets for loitering, be thrown in jail, and have all your belongings confiscated. The Race, Poverty, and Media Justice Institute offers PeopleSkool where professionals and other people can learn about a new kind of scholarship, the Scholarship of Poverty. 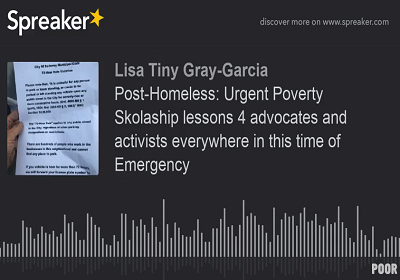 When: Regular broadcasts uploaded at PoorMagazine.org for Poor News Network (PNN)/Prensa POBRE’s YouTube channel. Listen to PNN Radio on Soundcloud, find different radio playlists at Spreaker and Podomatic. Where: Poor News Network/Prensa POBRE offers revolutionary educational and art programs, as well as, projects in print, online, radio journalism, multi–media skills and book publishing classes. PoorPress.net offers books, clothing, and multimedia.